I was really excited for Madeleine Roux’s second book, Sadie Walker is Stranded. I thought it was going to be very similar to Allison Hewitt is Trapped which I had found to be funny, witty and fast-paced. Roux kept a lot coming at the reader in that book and that is probably because it was originally a daily blog so she wrote it differently. 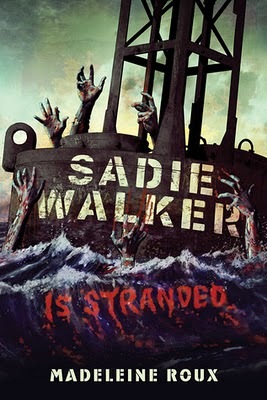 I was disappointed with Sadie Walker is Stranded. It was still funny and witty in parts, but I felt like there was something missing that the first novel had. There were large expanses where I just felt bored and like she was rushing through it entirely, but dragging me along with her as she went. She had a lot of good ideas for the novel, but I didn’t feel very immersed in them nor did I feel like she really went into any great detail about them. I kept waiting for the big moment where she went into the big scenes with the villain of the story, but all I got was a little less than a chapter after an entire novel built up to it. It was a total let down. I was also interested in seeing how she would incorporate the Allison Hewitt blog into the story since so many of the people in her zombie-verse read that blog. I was disappointed in that it was mentioned, but never really explored beyond the friendship that one of Sadie’s co-survivors once had with Allison and her now husband, Collin. Overall, I think she could have done more with the book then she did, there were so many great ideas that she had that she could have ran with. Book Information: Sadie Walker is Stranded by Madeleine Roux is available for purchase through amazon with ISBN 0312658915. It was originally published on January 31, 2012 through St. Martin’s Griffin.